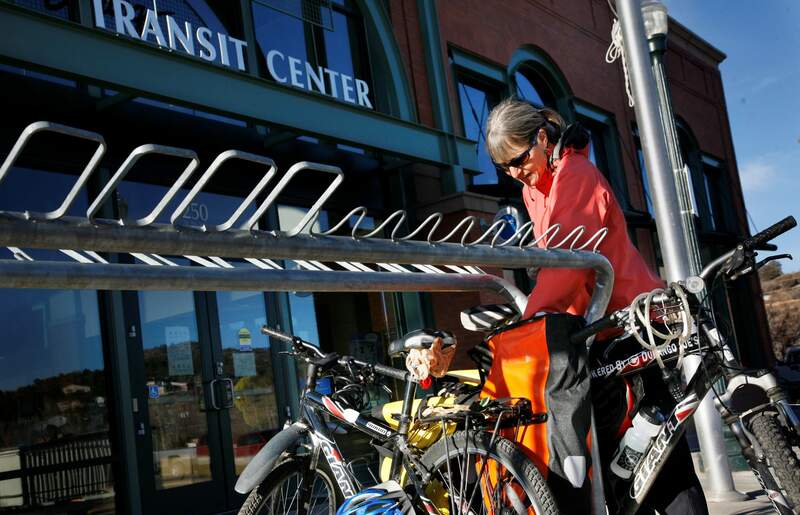 Fort Lewis College biology professor Dr. Cynthia Dott gets ready to continue on her way to work after a stop off at the Durango Transit Center. Organizers hope that a return of smoky skies over town in the mornings – a possibility due to the 416 Fire’s continued activity under dry and windy weather conditions – does not discourage people from taking part in Durango’s Clean Commute Week activities. A bicycle ride or a brisk stroll to work under a pall of smoke may not be appealing, but the point behind the clean commute effort is larger than the prevailing conditions this week. The goal is to get folks to try a cleaner, alternative way of getting to work in the morning and back home in the afternoon, realize how easy and beneficial it can be and then do it regularly – if not every day, then just once or twice a week. “Just give it a try, and see if you like it,” said Durango’s Assistant Director of Transportation Sarah Dodson. “It just has to become a new habit.” That habit, of course, can benefit our air quality, our town’s traffic congestion and our health in numerous ways. Events kick off at 4:30 Monday afternoon at Buckley Park with the Paul Wilbert Memorial Passeggiata, a slow ride in memory of the much-missed local man who was instrumental in launching so many of Durango’s trail and open space projects. The ride will be followed by a 5 p.m. community forum at Carver’s, with a focus on the city’s multi-modal transportation efforts. Tuesday’s main event is the Pedal vs. Metal Challenge, in which folks on foot and on bicycles will challenge those using motors to see who can run errands around town the fastest. We hope the contestants pounding the pavement and pushing the pedals do surprisingly well. Wednesday is Bike to Work Day, with 7 a.m. coffee and food welcomes set up at Mercy Regional Medical Center, for people who commute to Three Springs, and at Animas Chocolate downtown. A “Love your Commute” celebration will wrap things up at Ska Brewing in Bodo at 5 p.m. on Thursday, and will include the results of the Business Commuter Challenge, a week-long contest among area businesses to see which one can get the most employees to make a clean commute. Kudos in advance to everyone with the drive to leave the car keys in a pocket or purse, and the transmission in park this week.